Pooja was born in Chennai. On sep 20 2005 their marriage was fixed. Her husband name ravi who worked as a software engineer. They lived separately in a flat.Pooja has wonderful hair , and every women in the world will die to have hair like her. On Monday morning ravi went to office for work. Pooja was watching TV at home. At that time a neighborhood girl preethi come to see pooja.She was seeing pooja for the first time. She was shocked to see her hair . Preethi introduced herself to pooja and she said iam a hair beauty girl in the flat but you have beaten me , wow wow wow what a hair you are having madam.Pooja smiles and said don’t call me madam you can call me pooja iam just 22 years of old.Ok pooja iam going to my room I will meet you at 10:am .Pooja went to take bath meanwhile. She used 3 shampoo to wash her hair since it was long and thick she managed to take bath for 1 hours . She came out and dries her hair and started brushing her hair in front of the mirror. All her back view was covered by thick black hair.Peethi enters the room , and once again she was amazed by the wonderful hair.Pooja shall I brush you hair plz .No problem preethi come-on brush my hair.Pooja your green color sari is wonderful. Thank you preethi your salwar also super , and you also have wonderful hair preethi.No I will not accept it when compared to your hair mine is nothing.Ok ok come on brush my hair preethi. Preethi is slowly started to touch pooja head. Pooja just lie down a little bit , wow what a hair I want to kiss your hair pooja.OK ok just turn around to take center parting. When pooja turns around Preethi took center parting. She started style pooja hair. She held her hair tightly with her hand and started making braid. Finally the braid fell below her waist. Pooja changed her sari to pink salwar . She looked at preethi and asked how iam in salwar. Pooja you always look nice in any dress because of you excellent hair. Suddenly pooja stared crying, Hey pooja why are you crying plz did I said anything wrong . Plz stop crying . No preethi iam crying because next weak ennaku mottai poda porango. ( going to shave my head).Ayyo what no way you have wonderful hair plz mottai adikadhinga pooja.Edhuku de mottai , plz don’t do it. No way preethi iam going to loose all my wonderful hair in thirupati next week. This is vendhudhal by my husband I have to do , Iam crying for the past 1 one week after I heard the new from my husband. He made vow to god that if he get s good job then myself and my wife pooja will come and give the hair. So we are leaving next week are you willing to come with us preethi.Sure pooja I want to see your shave.Pooja just turn , ayyo avalavu mudi unnaku ,mmmm since it is for god I should not tell anything. Ok bye tell your husband to book ticket for me also . Ok preethi book ticket for mottai also , ayyo enna idhu no way I will die if I loose my hair . Sorry I just want to see your mottai.Ok bye pooja. Ravi came to home after his work. Ravi I got a new friend preethi and she is also willing to come to thirupati with us. Ok pooja nice , is there she is also going to bald. No ravi she just want to see mine. Oh pooja don’t be afraid of your mottai since it is just a hair it will grow back o.K. know ravi but this much of length will not grow back again. Since it is a god vow I accept it . Ravi kisses her head thank you my darling. You are giving her beauty for me thank you very much darling. Pooja sat on the bed and started brushing her wonderful hair.Ravi standing behind her and admires the beauty of women hair. Wow pooja you have wonderful hair shall I ask you one thing, sure ravi, nothing pooja can I brush your hair. Oh come on ravi iam your wife you don’t need any permission to comb my hair. Thank my dear just give that comb to me. Take it ravi , ravi is slowly moving his hand in to think black hair of pooja. 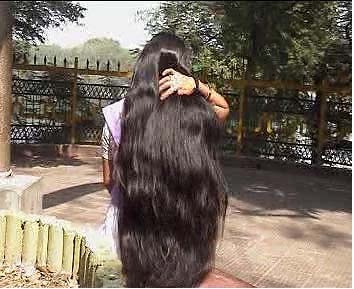 Wow wow wow what a hair pooja , lord balaji will soooo happy to have your hair. And iam so jealous of the barber who will bend your head and take your wonderful hair. Ravi is stared to brush pooja hair slowly. Pooja during your head shave don’t wear dark sari. Why ravi , Plz pooja wear light color sari .Iam saying this because when your hair fall from the head in your lap , if you wear light color sari then the black hair in your lap will look wonderful.Ok ravi I will wear light blue sari ok. Pooja I can feel the thickness of your hair wow wonderful hair my darling. Wow evalavu mudi , Preethi said you are going to shave your head. Yes madam , nice pooja you have wonderful hair I like it very much. Pooja you know my daughter preethi also have wonderful hair . Yes madam , but I want to shave her head also. What , why madam is their any vow. No pooja , actually preethi is loving a boy called raja , and he is loving preethi because of her hair . We don’t like that guy so if preethi becomes mottai then raja will not love her plz pooja I will send her along with you convince her to shave her head. Ok madam I will try my best. Appa I have a company , Preethi I will keep in suspense that you are also giving your hair. That evening pooja went to see preethi. Preethi was standing and looking at a calendar , and she was in her salwar and her hair wow it was loose and it covers all her back side. Pooja admires the beauty of preethi hair and just touched her wonderful hair. Preethi turn and welcomed pooja. Hi pooja have you booked ticket for me also , yes preethi we are leaving coming Tuesday ok.
Ok pooja I will be ready. Preethi light color sari irruka. Edhuku pooja , If you have light color sari plz bring it , you will look so beautiful in light color sari. Ok pooja I have white color sari I will bring it . Pooja thinks in her mind wow wow wow all her black hair on white was a view it will be . She slowly moved her hand on preethi hair and said you are the beauty queen in hair after my headshave , preethi smiles and said yes pooja. But on Tuesday both hair beauty queen will be mottai (shaven head). Preethi shall I ask you one thing, sure pooja, ok have you seen any headshave of women, no pooja iam so eagar to see yours , I thinked in my mind I also eager to see your mottai. Pooja shall I share my personal with you. Preethi you have became my best friend come on proceed. Pooja I loved a guy called raja he is handsome and good looking . He loved me very much because of my wonderful hair. My family are against our love , but yesterday when I came to know raja is already married and he is having 3 children’s he cheated me pooja , he will not leave me since I had beautiful hair , not only raja every males in the world see’s my hair they will definitely struck in love with me. Plz pooja give some idea to get free from raja. Preethi you make my job easy , I had wonderful idea to save you.Dont think about anything just sleep well we can go to thirupati as a happy trip ok.Ok pooja iam waiting for the trip . Ok bye I good night. Monday morning ( the time is 10 am) , Preethi came in to my room , hi pooja have you ready for the trip to give her beauty. Yes Preethi iam so nervous , ok let us see tomorrow . Pooja i have not seen any headshaves in my life did you know how the barber shaves the head of female. I know about it preethi but I don’t know how to tell. Shall I do it in real. What pooja I cant able to understand you , Nothing preethi you just loose your hair and come and sit in this sofa and I will shave your head like a barber. Hey what you are telling , Preethi don’t be afraid I will not shave you just I will keep the knife on your head that’s all , just I likes to give demo in visual. You will not loose any hair it will be fun shall I do it preethi. Ok pooja I likes to play but you should not cut my hair ok. Ok Preethi come on remove your thick braid , and come and sit on the sofa. I will be ready with my husband razor.Ok ok it should be only up to you keep the razor on my head then you should stop ok. Preethi is loosing her and sitting on the sofa.Preethi put all your hair in oneside.OK Pooja I will , wow wow wow beautiful hair wait preethi I will come back within 5 min ok . Ok pooja I will wait for you , Pooja came with a box and she kept in front of Preethi. She kept the box in a table and move towards Preethi , Pooja just kept her hand on the loose wonderful thick lengthy hair of preethi , she started to move her hand all over the hand on the wonderful hair which was cascaded on the left side of Preethi. Pooja rubed her hand over preethi hair. Ok shall we start preethi. In turn preethi was very excited to see what pooja will do. She simply said yes we can start preethi. Ok preethi , Pooja started to open the box it contains a straight razor , a blade , and a comb. Preethi your hair so dry in order to clean shave it must be wetted completely . Do you have objection in wetting your head. Hey pooja come on I have no objection you can do anything , ok wait I will bring the water in a mug. Pooja went inside the bath room and brings the mug of water. She kept the mug in front of preethi . 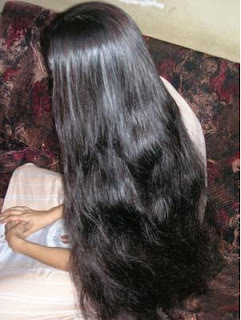 Pooja came close to preethi she slightly bend her head forward , preethi’s head was bend down , as she bend down pooja grab the entire bulk of hair which hangs on her left side with the help of her 2 hands . Since her hair is so think pooja cannot able to grab the hair with single hand so she used both of her hand and grabbed the entire bulk of wonderful hair and put it in front. All the hair of pooja was in front of her face. Since her hair is thick her face , her upper body is completely covered by beautiful hair . She took the mug in her left hand and reached preethi who was bend down with all her on her front. Pooja reached Preethi and she took some amount of water in her right hand . Preethi was unable to see what pooja doing since her face was completely covered by hair. Pooja slowly started to pore water on the middle of the head . She took a hand full of water and slowly she pored in to the preethi hair . She started massaging preethi hair . She used a full mug of water in order to wet Preethi hair. The hair is completely wet and she could feel the chillness. Preethi could feel the water all over her body . She slightly moved her thick black wet hair in order to see what pooja was doing. Pooja was changing the blade on the razor. Preethi feels some kind of feeling inside her she want’s pooja to shave her head immediately , Pooja slowly came forward and bend her head , She kept the razor in the middle of the head . She was about to move , But preethi stopped ok ok now I can able to know how headshave’s are done . We can stop Playing iam getting so exited . Ok iam going to purchase some things for tomorrow so I have leave we can meet tomorrow ok pooja we can meet tomorrow. Bye !! Tuesday morning all the 3 of them went to thirupati. They reached thirupati at 12:am. Ravi booked a room , and he said we are going to kalyakatta immediately. Pooja said wait for 15 min I will be ready . Ok I am going to have cup of tea I will come back within 20 min be ready my dear. Ok weared light color sari and loose her wonderful her hair and sit outside the room. Preethi made her hair in tight braid and came out. When she see Pooja sitting with loose hair she run immediately to pooja and kissed her hair. Preethi said I cant able to explain the beauty of your hair pooja it look wonderful. Pooja said yes it is only for 30 min then my head will be like a cue ball. Pooja asked preethi to sit , and she slowly asked her preethi I said before that I have idea for you in order to escape from raja. Yes pooja what is the idea, Preethi the idea is very simple you should shave your head with me. What ??? , Preethi neeyum mottai adichiko. What pooja no way plz I don’t like the idea , Preethi first listen to me it is the only way for you to get free from raja , you said he is loving you because of your hair , if you are mottai then he will not turn you back so plz accept my idea . I also know you like headshave , I watched your excitement when we played a headshave game in my house. Yes pooja good idea to get away from raja my mother will not allow me to shave my head. Don’t worry your I asked permission from your mother so no problem just remove your braid and get ready. Pooja is it dream or real wow I was tensed pooja. This Is a first time iam going to shave . Hey preethi you see my hair is thicker and longer than you I also more exited about the shave so we can enjoy. Did ravi know about it , yes he know about it. 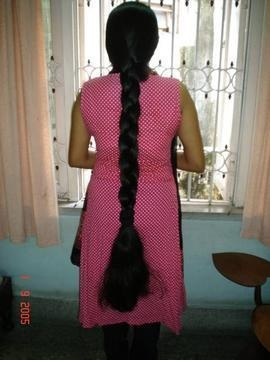 Ok pooja quickly remove your braid and get ready . No I will remove it on the kalyanakatta . Ravi came inside , ok girls shall we move , ravi saw a nervous and tensed girls. Come on girls don’t be tensed just enjoy the shave come on lets go . They went near to the shaving area , Ravi weared a t shirt and Pooja wears a light blue sari and preethi wears a white color sari. Pooja asked ravi to make brush her hair and make bun . preethi wears her in long thick tight braid. They removed their slippers in the counter and went inside the kalyanakatta. Their was a huge crowd since it was a festival time. All the huge crowd just turned and keep their hand on their mouth went they saw preethi and pooja stands in the mottai (head shave) line. They waited in the line for 1 hour and 3 of them get the ticket from the counter . The counter man asked preethi and pooja where they are going to trim their hair , But pooja and preethi replied illa mottai , the counter man put mouth opens after hearing this , since he can able to view the hair of preethi and pooja. He issued a ticket with 7 o clock blade. Pooja and preethi felt exited after they get the ticket. Preethi barber number and pooja barber number are same , and ravi gets a separate number since he was a male. They entered in to the mottai area. Ravi asked preethi and pooja to be safe and have your shave I will come go to my barber for the shave . Ravi moved closely to Pooja and he moved his hand over her large bun and said thank you dear you are loosing you beauty for me. Ok ravi you go for your shave since preethi is hear we can manage. Ok I will come back soon to watch your shave. Ravi went to shave since his line was too short he immediately sit in front of the barber, Pooja and Preethi went to their barber , since it was a girls section there are nearly 40 more than females are ready to shave their head. They went near their allocated barber . The line has one lady who has waist length hair and a young girl who has below waist length hair. The young girl will be of 14 years old. The lady wear red color blouse and sari. First the lady then the young girl then pooja and then preethi. All of them inside that circle was amazed to see pooja and preethi . Pooja removes her bun slowly wow wow wow all her cascade wonderfully on the back side. Preethi asked pooja to remove her braid, Pooja slowly removed her braid wow wow her hair also looks more beautiful when it was loose. Since they both were in light color sari their hair look wonderful than normal. The barber felt excited when he see pooja and preethi loosening their hair, The barber prayed to god that they both should shave their head , They should not came her to trim. Barber asked the waist length lady in front to sit , And he asked Pooja madam mottaiya , illa trima , pooja replied illa mottai. We both are going to shave the head . The Barber was so exited to hear this. The barber first start with the lady he poured huge amount of water on her head , he took center parting and make two knots , he started to shave her head , the lady wonderful hair fell from the head to the lap. Pooja and preethi watched the shave in nervous. Then the young girl , She styled her hair like a school girl ( a two braided hair style) . The young girl mother came and gives the ticket the ticket to the barber . She about to loose the girl hair but the barber said leave it , I will shave her head with this hairstyle itself. That girl bend before barber with her 2 braided hairstyle , The barber holed the braid tightly and stated to wet the braid . He moved his all over the tight braided head and finished wetting the hair. He hold her head tightly and bend her head forward , the barber starts from the middle of the head , he just pushed the straight razor from the middle to behind , young girl braid started to fell from the head to the ground . Head of pooja. Pooja’ s lovely hair begins to wet. Since he poured handful of water the middle part is some what wet. The barber continuously took water and wets pooja ’s hair. He took the entire bulk of hair from back side with his right hand and place the entire bulk on the top . He took some amount of water and started to wet the entire bulk , He gives massage to her head continuously for 3 min. since her hair was so thick it was not easy to wet . He took the entire bulk of her from the top with his right hand and put it on front . Wow wow wow the hair touches the ground. Preethi watched everything in nervous. The barber took huge amount of water with both of his hands and and with the handful of water he rubbed pooja’ s head for 2 min . Finally one small bucket full of water is poured on pooja’s head. Her hair was completely wet , all her hair was in front of her eyes. The barber took the straight razor and load the blade. Pooja could not able to see the barber since her face was completely covered by hair. Suddenly she felt a hand on her head , She know it was the barber hand , She started crying lit bit and she hold her hair tightly which hangs in front of her. The barber moved her head down little bit and tightly held her head , he slowly started at the middle . He slowly moved the razor forward , since all the hair was in front huge bulk of hair moved from pooja head and dropped in front her eyes to the lap. Since she weared a little color sari the bulk of hair fallen down from the head looks fantastic. The barber slowly moved the razor all over her front wow wow huge bulk of hair leaves the head and fell on the floor since the hair was loose , the lap of pooja was filled with huge amount of hair. She cried when she see the hair coming from the head. The barber finishes the front and asked her to turn and sit. She did it . When she turn she about to face preethi and ravi, Now pooja was half mottai , all her front hair was gone , now the barber asked preethi to madam plz will you braid your hair tightly it will be more convenient for me to shave plz madam braid your hair , since preethi was so nervous she was unable to braid , Pooja asked ravi to braid her hair plz with half mottai , ravi asked preethi to sit down since the hair was so dry ravi could not control its thickness so he took some amount of water and started wetting preethi hair , he keep on pouring water to wet her hair , then he took his pocket comb he hold preethi hair tightly and started to braid , finally preethi hair was tightly braided by ravi. Meanwhile the barber started to shave the entire back and side of pooja hair , huge hair went down to the floor. The barber smooth the pooja head by running the razor again and again. Half of the area on that circle is filled with thick black pooja’ s hair. She got up as soon as her head shave finish. Next was preethi she went and sit before the barber in tight braid , barber took the braid in his hand and he took some water from the bucket and started wetting the braid he put down the braid in front and he keep his hand on the center parting of preethi hair and started to pour water in the parting area. Now preethi was completely wet and the barbers took the razor and bend preethi forward and started to shave her head. She tightly held his hand near to the center parting and starts to run the razor from the parting area slowly he moved the razor all over the head by holding the head tightly , preethi’ s huge braid fell down to the floor. Half of the braid was on her lap. Now both preethi and pooja looses their wonderful hair.